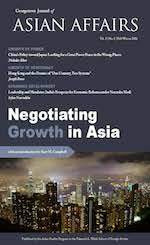 The Georgetown Journal of Asian Affairs is an open-access, peer-reviewed journal published by the Asian Studies Program in the Edmund A. Walsh School of Foreign Service. The Journal publishes social science papers written on issues relevant to politics, security, economy, culture, and society of contemporary Asia, including Pakistan and Afghanistan. In addition, each issue features policy viewpoints and interviews on timely topics in Asian affairs. For more information, including submission guidelines, visit the Asian Studies Program's website.